It's breakfast time and Gemma wants to know if there have been any phone calls for her but there hasn't been any. Jim is glad that Gemma is helping Helen at The Coffee Shop today, later on there is basketball match that Jim is going to, Gemma says she might go. Doug arrives, he is going to the match as well and offers Jim a lift but he declines. Matt arrives to drive Gemma to work. 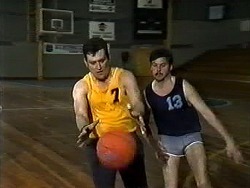 Doug reckons he is a good basketball player but Jim isn't so sure. 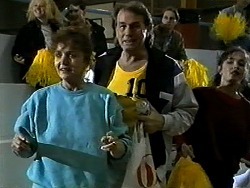 Melanie arrives carrying two very large yellow pom poms and dressed in a bright green tracksuit. Everyone is stunned into silence for a few seconds until Matt starts to applaud. Matt, Gemma and Melanie leave, Gemma isn't keen on being one of Melanie's cheerleaders! Dorothy has slept in, her date kept her up late last night. RYAN: So are you going to see him again? DOROTHY: I saw rather more of him than I expected last night. The phone rings and Dorothy tells Ryan to check who it is before he puts her on, it's John but he's not sure which one so says Dorothy is out! Melanie wants Chrissie to be a cheerleader but she is out. Melanie asks Caroline to tell Chrissie where the game is. Caroline says she is too busy to go, Melanie points out that Jim and Adam will be there but Caroline doesn't want to see them, Melanie thinks the team will lose unless they get more support, Melanie goes on and on until Caroline agrees to go! DOUG: Unless you can knock him out so you're old man can get a game? Doug and Adam laugh, Adam announces he isn't going to chase Caroline anymore. Matt and Gemma are driving, Gemma is in a bad mood, Matt wants to go to a party but Gemma wants to go for dinner. MATT: We can do that any night of the week. Gemma is unimpressed so Matt decides to go on his own. Gemma tells him to stop the car; she wants to walk the rest of the way. Matt wants to know what's wrong but Gemma won't say, he offers to go for dinner but she gets out the car. Caroline stops by to see Helen but she is out shopping, Gemma is in charge for now. Gemma says she is having boyfriend problems just as Adam arrives, he apologises to Caroline for the other day, and he wants to be friends. ADAM: Is that a smile? He is delighted that Caroline will be at the game and invites her over to his later as there is a party after the game. Number 30Melanie does her routine for Dorothy and Ryan who look a bit bemused! It turns out Melanie is playing so she wants Dorothy to be a cheerleader! 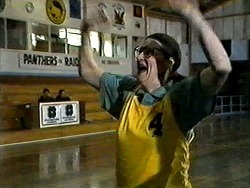 She isn't keen but she used to play basketball so they decide Dorothy can offer some advice! Pam, Adam, Des and Doug do some stretches; Paul can't make it because of work so Doug is the only sub which worries everyone. Jim arrives and Adam goes to speak to him but the atmosphere is somewhat frosty! Doug bets Adam 10 dollars to score but he misses, Jim strolls up and throws the ball through the hoop, everyone is impressed. Adam tells Doug that he thinks Caroline might go back out with him after he saw her this morning. Matt apologises to Gemma but she is busy and shrugs it off. GEMMA: If you don't know what you have done I'm not going to tell you. Gemma storms into the kitchen. Pam gives a pep talk as Caroline arrives, Adam talks briefly to Caroline before the game starts, it doesn't take long for the opposition to score. 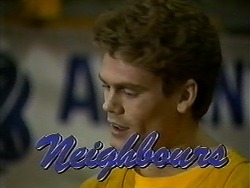 As the Raiders attack (Ramsay Street Raiders), Des falls over and twists his ankle, he can't play anymore and no-one can find Doug, Melanie suggests Dorothy to play as she used to when she was at school. 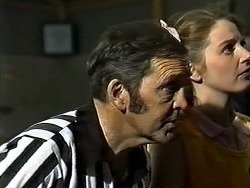 The referee puts pressure on Pam to get a sub on so Dorothy ends up agreeing to play. Matt wants to know why Gemma is so upset, it turns out that it's her 18th birthday! Matt said he never knew but Gemma thought he did. MATT: I'd never forget that, honestly. GEMMA: I guess I made a mistake. Gemma is upset that no one knew, Matt says he will organise a surprise, they are going for dinner and there is another surprise ahead! Dorothy has scored but the Raiders are still losing, Doug arrives back and goes on to replace Ryan as the Raiders score again. Gemma and Matt are stacking the chairs, Gemma apologises for being in a mood earlier, Matt knows show she feels, Kerry was the only one who knew about his 18th. The Raiders are winning by one point with not long to go as Melanie throws the ball to Dorothy who then finds Doug and then it's onto Adam, Caroline waves to him as he collects the ball he turns into Jim, knocking him to the floor. He has hurt his wrist; Jim thinks he did it on purpose as does Caroline.